G-Shock never fails to amaze, which is obviously a great thing. 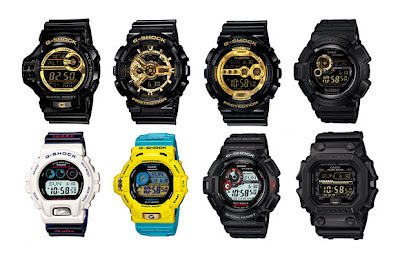 Casio's June 2011 release of their beloved G-Shock watches might stop people in their tracks. 3 out of the 8 timepieces are from the upcoming Metallic Gold models, which is a continuation of the Black x Gold collection. Aside from the sophisticated black & gold models, the bright colored white, teal, and yellow Riseman models are part of the Love The Sea and The Earth Collection. Proceeds from both models will benefit environmental-advocacy groups, EARTHWATCH and Kurkku. The collection will be made available at G-Shock retail locations worldwide within the upcoming weeks so stay tuned!